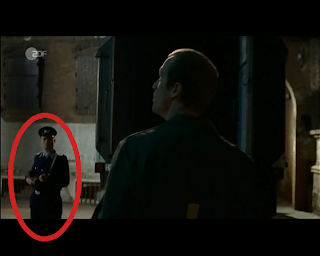 I think I mentioned it briefly [..no I just checked, and I didn’t…], but last year in October I had the opportunity to be an extra in an german television movie called „Die Todesautomatik“. I was with them for a day playing an east-german soldier first and then playing a warden in a jail. As I was an extra (or „Statist“ in german) I got paid for the day but it was much more interesting to look behind an somewhat big film production. 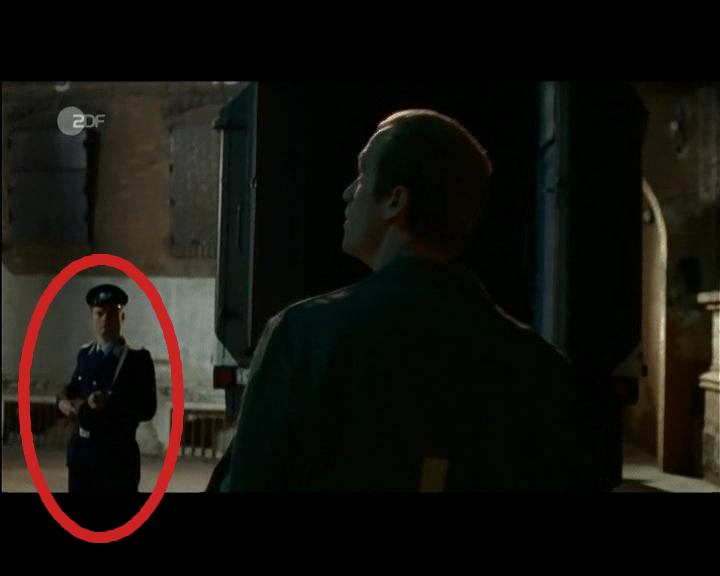 The movie was broadcasted in german television on Monday evening. I was excited to a degree whether I would be in the final film or not. And I am! 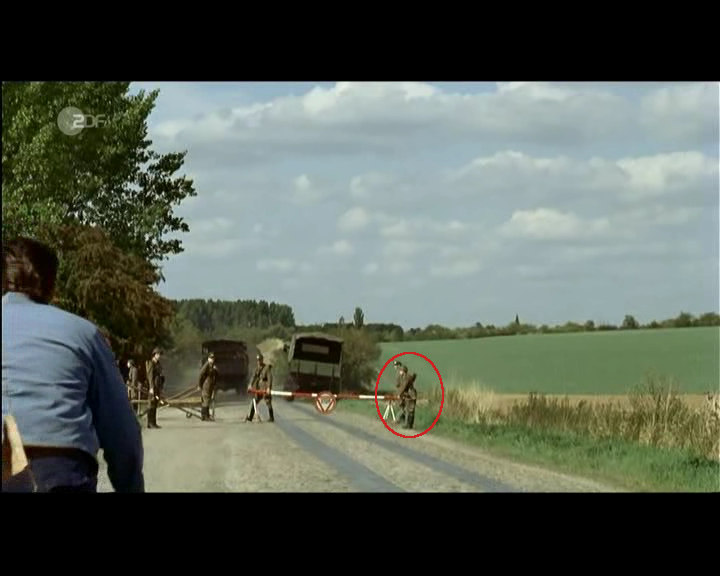 However, I appear for very few seconds on two occasions very early in the movie. I’ve tried to capture the scenes I’m in and marked myself in the two pictures. It was a cool experience although I had the impression -and it shows a little bit in the movie- that historic details weren’t so important for this particular production. Unlike e.g. „Good bye Lenin“ the GDR culture is portrayed in a very general yet much too cruel way. On the other hand the amount of illusion is stunning. It’s funny to see the movie and know that the road to Berlin is of course not even near Berlin but a small village near my hometown. The story seems to be adapted from real events but in my impression it was tailored a lot to fit the usual pattern for an entertaining Monday evening tv movie. It tried to hard to get several aspects into the movie although it might have been wise to focus on just a few characters and a shorter time frame. Shooting the two scenes -which together last for about 5 minutes – took one day where they first shot the street stuff in the first half of the day. We had to wait for about 5 hours already wearing the uniforms and making the small scene I’m in (less than 30 seconds) took about 1 hour. Afterwards the whole thing should be over, but then they asked me whether I’d like to be in another scene playing a guard because someone else probably couldn’t make it. I tried the other uniform and because it fit me they took me to the second set which used to be a real jail in my hometown. We had lunch and afterwards I waited with two other extras for other scenes. One of them I knew from university and it was quite a surprise to meet him here. I not only got a new uniform but also some make-up and fake hair to look different. At about 21.00 we we’re finished. I didn’t know when the movie would be on tv or even if my scenes were in it. Obviously they are, but if you don’t know where to look you probably don’t recognize me.